The best business model in America has its worst year ever. Is it cord-cutting, or something more complicated? "The pay TV industry has reported its worst 12-month stretch ever," analysts Craig Moffett andMichael Nathanson wrote in a report yesterday. Cable is in a free fall, led by Time Warner Cable's horrendous quarter, in which it lost 306,000 homes while it blacked out CBS over carriage fees. Quartz's Ritchie King, who absolutely has the best graphics on this phenomenon, charts the big picture. First, look right: Netflix is on a tear. Then left: The pay-TV business is clutching the 100-million-household bar like a baby sloth, as cable implodes but satellite and telco (e.g. : Verizon, AT&T) subs make up the difference. 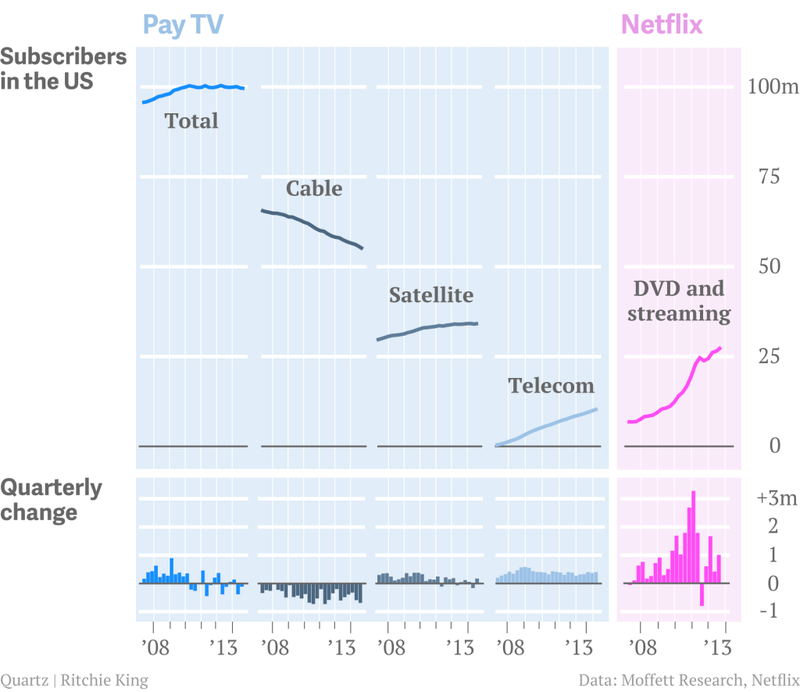 One story you could tell with these figures is that Americans really are cutting the cable TV cord. Maybe. But maybe the story is more complicated than that. The number of Americans signing up for Netflix, Hulu, and other sites is growing much faster than the number of Americans leaving pay-TV altogether. Most Internet TV is complementing, not replacing, the cable bundle. Meanwhile, pay-TV, which has been the best business model in the world, might be a victim of its own success. 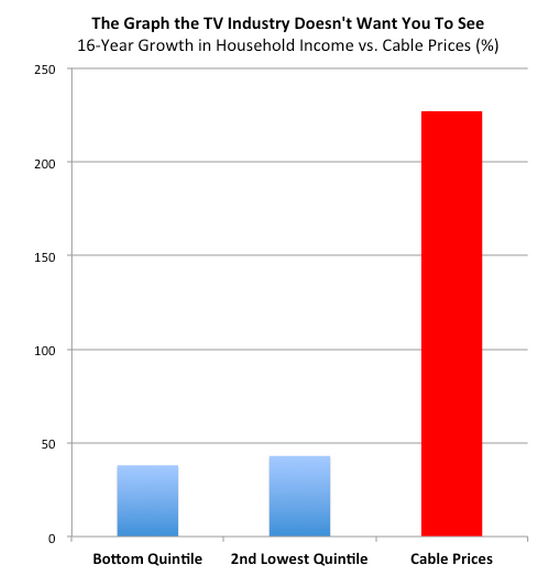 Individual channels fighting for their own subscription fee hikes have contributed to a bloated cable bundle that's grown five times faster than incomes for the bottom 40 percent of the country. Television, a populist product if there ever was one, is charging its way toward becoming a luxury good. In the short term, the pay-TV companies that bundle television with Internet and phone are still swimming in profits. But with any foresight, the infrastructure and entertainment companies that bring us our favorite TV shows should realize that, although their businesses remain fundamentally sound, the economic fundamentals are not pointing in their favor. *Let me preempt the inevitable comment that goes something like: "Yes, Derek, like an observer on Titanic's deck arguing that the rate of submersion has declined over the past 20 minutes."